I got a gorgeous Kalanchoe thyrsiflora plant from a friend of mine two weeks ago. 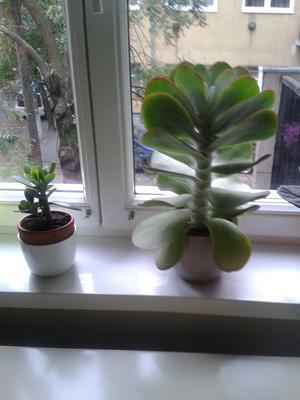 I live in Budapest, Hungary, the plant lives in front of my east-facing window which sadly doesn't get too much light due to the next house being too close. The lower leaves of the plant started hanging lower and lower and I am very worried that it will die. I water it about weekly, the soil always gets pretty dry between waterings. It might be too cold for the plant so close to the window (temperature outside gets very close to 0°C lately, although my windows are insulated). Or it may be too hot for it there, my gas convector heater is right under this window, although it is set to minimum. Or it may be too dark for the plant there, but I can't provide it any lighter place in the apartment. 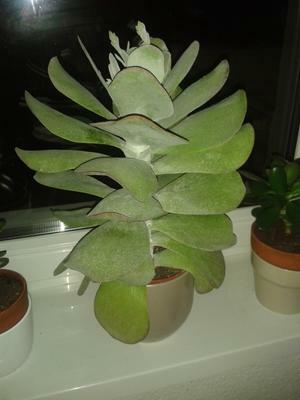 I took two pictures of the flapjack, one in the morning about a week ago, it shows the lighting conditions in the room, the other I took just now and shows how low the leaves are hanging. They feel a bit softer to the touch as well. I would love to get any sort of advice, I really want to keep this plant happy. Hi Dora, light levels are crucial for these kinds of plants as they originate in extremely bright conditions. So, that's one thing. The other thing is that they need 12 hours of light. Anything less, and they start to struggle. The other thing is that the plant is gigantic for that little tiny pot. The lower leaves in these conditions will senesce, or die, and there's really nothing you can do to save them. Even if you repot it right now, those leaves are toast. So there are a couple of things you can do. One is to stop watering it, to prevent it from growing any taller. The plant looks like it's starting to bloom, which could be why it's got so tall - some of these in perfect growing conditions can be four or five feet tall and then they bloom. Have you signed up for my Winterizing Succulents E-Course? It has lots of tips and ways to keep your succulents happy inside for the winter.